Amongst the Dodecanese Island, Rhodes shines the brightest with its endless pebbled beaches, rich forests and ancient history. Travellers visit the island in search of a vibrant nightlife and shimmering azure waters, while others seek cultural adventures through past civilisations and times. Rhodes has it all. The island’s walled Old Town is the most well-preserved medieval town in existence today. Its charming atmosphere and setting mellows even the most discerning visitors who are transported back to a time where Knights paced the land and the Byzantines ruled the island. The town’s cobble-stoned alleys invite all visitors to explore and seek its hidden treasures. 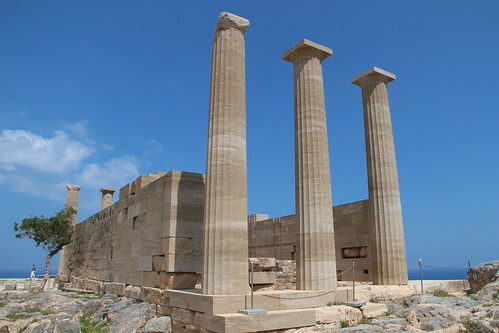 The Acropolis of Lindos is a must-see! Its seductive combination of Byzantine and Doric architecture captivates all visitors as they look upon the ancient Acropolis a get a glimpse of its past greatness. On site you will also find other impressive ancient ruins like the Hellenistic Stoa and Saint John’s Church decorated with elaborate frescoes. The Temple of Athena is also a sight for sore eyes built in the 4th century and still standing. This impressive structure symbolises past civilisations’ adoration towards the goddess. Rhodes is very famed for its honey. The honey produced on the island has quite a distinct taste in comparison to all others because it is produced by bees committed to thyme, a herb that resembles oregano. Besides thyme, bees are also attracted to other herbs and flowers on the island, some of which are rare, thus adding to the aroma of the honey. Locals in several villages like Siana and Vati specialise in the production of honey. The island of Rhodes has a rich history of winemaking dating as far back as the Neolithic period. till this day Rhodes is known as one of the main producers of Greek wine as it is blessed with long summer months and little rainfall, ideal for cultivating grapes. Rhodian wine is considered as one of the finest in the world, and its reputation goes beyond the borders of Greece. When holidaying in Rhodes it is highly recommended you take a tour through the island’s charismatic wineries and vineyards where you get to sample on all varieties and even witness the entire procedure of winemaking. One of the most modern wineries is Emery, which is found in Embonas Village. Nonetheless, the list of wineries available is endless, where you can take your pick choosing from small traditional vineyards to more contemporary establishments. Rhodes is a place of beauty and mystery waiting to be unveiled before you. The island’s natural beauty is undeniable, its rich cultural background is alive to this day and its homemade products are to die for!